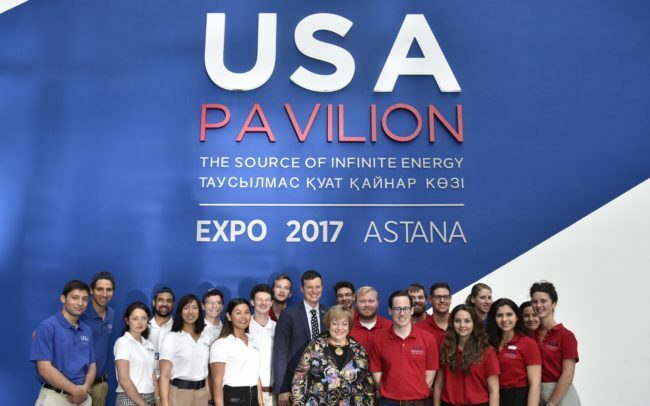 ASTANA, KAZAKHSTAN – Today, the USA Pavilion at Expo 2017 welcomed a Presidential Delegation from the United States, led by U.S. Deputy Secretary of Energy Dan R. Brouillette and other key government and business leaders. During their visit, the delegation was treated to an immersive experience showcasing America’s pioneering spirit of innovation, followed by hands-on interaction with some of the revolutionary new technologies being pioneered by leading U.S. companies including General Electric (GE). The delegation, led by Deputy Secretary Brouillette, also included U.S. Ambassador to Kazakhstan, George Krol; U.S. Congressman Kevin Cramer (R-ND); Ray Washburne, President and CEO of the Overseas Private Investment Corporation (OPIC) and Lisa Curtis, Deputy Assistant to the President and Senior Director on South and Central Asia at the National Security Council.